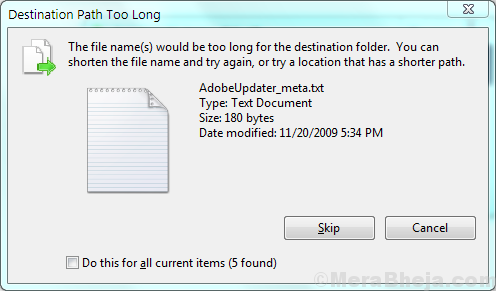 The file <file name> is too large for the destination file system. This error typically occurs with USB drives when the user tries to copy a single file larger than 4GB in size, despite the fact that the USB drive has sufficient space for it. Eg. Let us suppose you have a 16GB USB drive, however, you are trying to copy a 4.6GB file to it. Despite the fact that the USB drive is empty, you would face this error. The cause is that the USB drive has been FAT32 formatted. This forces a policy to the USB drive that no single file more than 4GB of size could be copied to the drive. We could copy multiple files to the drive occupying total space equal to the volume of the drive, but no single file could be more than 4GB in size. The resolution to this issue reformat the USB drive and change the File system. However, this would erase all the data in the USB drive, so you could temporarily copy it elsewhere and replace it after formatting. 1] Open File Explorer >> This PC. 2] Right-click on the USB drive and then on Format. 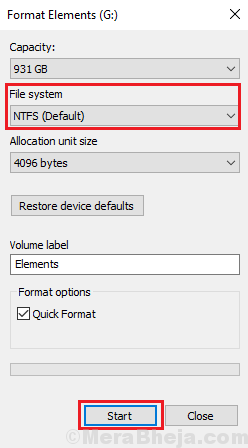 3] Change the File system from FAT32 to NTFS. 4] Check the Quick format option to make the process quicker and then click on Start. Once formatted, unplug and replug the USB drive and you would be able to copy your file now. If the above procedure is problematic for any reason, try formatting the USB drive through Command Prompt. 1] Type command prompt in the Windows search bar. Right-click on the Command prompt icon and select Run as administrator. Where X: is the drive letter of the USB drive. 3] Restart the system and try copying your file. It would work this time.